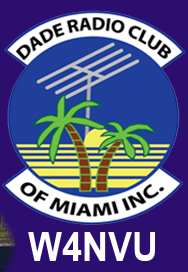 September 2011 Meeting Minutes – W4NVU – Dade Radio Club of Miami Inc.
Meeting was called to order at 19:40 with 19 present. The minutes were not posted and are tabled until next month. 147.000 – It is not working. It is turning itself on and off. Due to site access, we cannot go and repair it. As Merritt had said before, once the 000 dies, it dies. We are not allowed on the tower. They recommended the Metro Zoo tower, but it’s only 150 feet. 147.760 – Up and running. Ray has to go and fix it with supervision. 444.200 – works fine and needs visitors to talk to. 1291.80 and 56.660 – nothing was said. Digipeater 144.39 – it’s not showing as per Tom Morris. The October Picnic was discussed. Hamfest – The building was sold. A mini hamfest/lea was discussed for March 12, 2012. Ham class last month was a huge success. University of Miami wants us to set up a Ham shack. David and Jeff are here from the ARRL to present an award. MS Committee is doing a race. Ben Nemser will do next month’s presentation. Lee gave a presentation on surplus military radio PRC Bravo. Informative presentation. Thank you Lee.